A giant plume of ionized gas called plasma (to the right) leaps off the sun from sunspot 1283 in this photo snapped by NASA's Solar Dynamics Observatory. 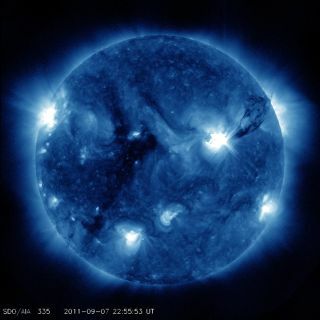 This sunspot spouted four solar flares and three coronal mass ejections from Sept. 6-8, 2011. An active region of the sun that blasted out powerful solar storms four days in a row last week likely isn't done yet, scientists say. Officially, the flare-spouting region is called sunspot 1283. But space weather experts have dubbed it "Old Faithful," after the famous geyser in the United States' Yellowstone National Park that goes off like clockwork. And the solar Old Faithful should erupt again before it dissipates, researchers said. Sunspots are temporary dark patches on the solar surface caused by intense magnetic activity. Some last for hours before disappearing; others linger for days, weeks or even months. Powerful solar storms often erupt from sunspots. These include radiation-flinging solar flares and phenomena known as coronal mass ejections (CMEs) — massive clouds of solar plasma that can streak through space at up to 3 million mph (5 million kph). While the rapid motion previously observed in sunspot 1283 seems to have died down a bit, Young said, the sunspot looks poised to erupt again sometime soon. "There's a good probability that we're still going to see at least another M-class flare, possibly another X-class flare," Young told SPACE.com. It's not uncommon for sunspots to pop off a number of powerful flares in quick succession the way 1283 has done, he added. That seems to be the natural order of things. "When you see one big flare, your chances of seeing another one are pretty good," Young said. So researchers are working hard to better understand sun storms, with the aim of one day being able to predict them with a great deal of accuracy and a long lead time. But they're not there yet. "We still have a long way to go to really have the kind of forecasting capabilities that we have with terrestrial weather," Young said. That's not to say scientists aren't making progress. Indeed, they've learned a lot about solar eruptions lately, Young said. And the knowledge base will continue to grow, he added, as a fleet of sun-watching spacecraft beam home more and more observations of Earth's star. "We're really in a great time right now in terms of the data that we have," Young said, citing the contributions of spacecraft such as NASA's STEREO and Solar Dynamics Observatory, as well as SOHO, a collaboration between NASA and the European Space Agency. "It's going to be pretty exciting, from a solar physics and a space weather point of view." All of these eyes on the sun should be treated to quite a show over the next several years. Solar activity has been ramping up over the last few months as the sun works toward a maximum in its 11-year activity cycle. Scientists expect the peak of the current cycle, which is known as Solar Cycle 24, to come in 2013.